This will be my last post on Jersey Tomatoes. Summer is almost over and it's time to make some recipes with other "end of summer bounty", and anyway, the squirrels have stolen all of my tomatoes, so I have none left to blog about!!! What to do with all those ripe Jersey Tomatoes Part II. I made a great tomato salad for lunch with everything local, including the fresh made mozzarella from Antonio's Mozzarella Factory in NJ (except for the Greek olives!). 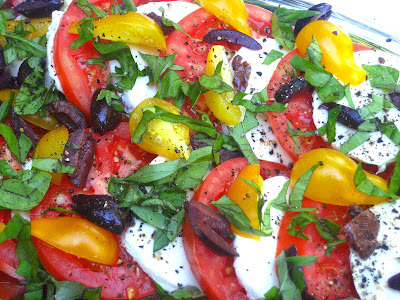 Assemble tomato slices and layer with sliced, fresh mozzarella cheese. Make a chiffonade of basil (roll your leaves together, and slice into thin strips, this is "chiffonade"). Chop kalamata olives, & yellow baby pear tomatoes and throw on top. No salt is needed, but I like black pepper. Dressing: 1 tbsp. of basil pesto & 4 tbsp. of olive oil. Whisk w/ a fork. Serve with crusty bread. Makes a great first course or lunch. Another simple pleasure of summer.............which is almost at its end. Boo hoo. Really can't beat fresh tomatoes. All summer long, so many varieties! I'm going to the garden now, your post made me hungry! Beautiful. The kalamata olives are a nice and flavorful addition. It looks like the perfect salad! I love this combination. I add a little grated Parm and some balsamic vinegar. Yum!